Your suit could be a double agent! How to wear your suit jacket as a blazer. "Son, you must only buy whatever goes on sale!" Hence, why I have four different flavours of ice-cream stashed in my freezer during the winter. Where I'm getting at is that your two piece suit (jacket and trousers) doesn't need to be exclusively worn together. I'm a huge fan of considering my clothing purchases as an investment and so should you. Taking more thought into your clothing purchases in regards to timeless style, durability and versatility within your wardrobe will make it an investment in the next few years to come. Thus, it’s important to maximise the largest expense you’ll usually make on a single piece of regularly worn clothing. This more often than not, is the “suit”. Traditionally, blazers originated from two places. The Lady Margaret Boat Club (1825) and early adapted military blazers in the 1800s. What’s most distinguishable between most suits jackets and blazers is the use of traditional buttons. Blazers use buttons that stand out because the intent behind wearing a blazer is to represent the old traditions of a club or a profession. Popular buttons that blazers have include “mother of pearl”, “plastic colour variations” or “metals” such as “silver and gold”. The more colour variant the buttons is to the jacket, the more likely it can be worn as a blazer. 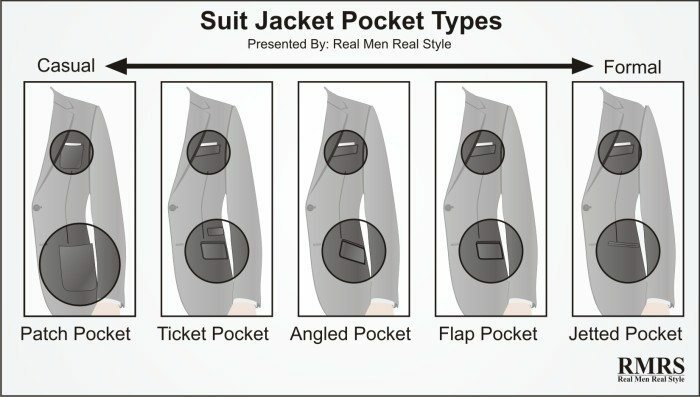 ﻿The pockets on a jacket create crucial details to where it lies on the formality spectrum. Blazers lie in the middle between the suit (formal) and the sports coat (less formal). This means the ideal pockets that will make your suit jacket look like a blazer are angled, with ticket or patch pockets. Most suits will have flap pockets which in my eyes is still viable for a blazer. Shawl lapels are reserved for formal events such as “black tie” and “white tie”. These events will not be requiring you to wear a blazer. Thus, shawl lapels are not appropriate for blazers. Peak lapels and notch lapels will be fine. Suits that exhibit more patterns and colour are easier to be worn as blazers. This is because solid colours are usually used for more formal events and patterns for less dressier ones. Most patterns including herringbone tweeds, houndstooths and check suit jackets are easily matched into blazers. Almost every patterned suit jacket is acceptable EXCEPT for fine pinstripes. In my opinion, fine pinstriped suits look “off” when divided and paired with other items. In fact, the separate pinstripe suit jacket looks “off”. Almost as off as the last bottom button fastened on the gentleman’s jacket. So there you have it. 4 simple tells to whether your suit jacket can be a blazer.